After teasing in May the launch of over-the-top streaming TV channels for three of its brands, Condé Nast has debuted its first: a channel for science and tech site Wired hit Apple TV, Amazon Fire TV and Android TV on July 1. It will reach Roku in the next week. Audi, HP, Quicken Loans and Verizon are the first sponsors of the new Wired video channel, which will be free to watch. They will run ads on the channel until the fall. 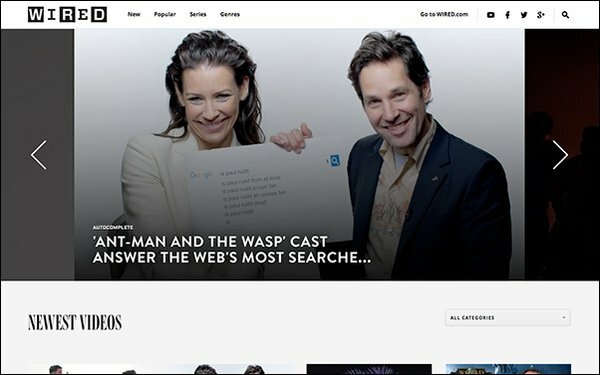 Wired's OTT channel will stream popular videos and shows from its site and YouTube channel, including shows like "Autocomplete Interviews” and "Technique Critique." Wired will also roll out programming made for its streaming channel, as well as license movies and TV shows. Channels for Bon Appétit and GQ will follow in 2019. A TV-consuming audience exists for Condé Nast’s brands. The publisher received 12 billion views for digital video content on social, syndicated and owned-and-operated properties in 2017. Wired's YouTube channel has 2.3 million subscribers and 643 million video views. The idea is Condé Nast's OTT streaming channels will reach even more people, using recognizable publisher brands to attract viewership on connected TV devices. “Our video business is one of the most important assets to our company’s future, recognized by our audiences and advertising partners alike,” Condé Nast CEO Bob Sauerberg wrote in a memo to staff, announcing the departure of Condé Nast Entertainment president Dawn Ostroff last month. Ostroff is now Chief Content Officer at Spotify.